ACUERDO SOBRE LAS DELEGACIONES DE COMPETENCIAS EN LA DIPUTACIÓN PROVINCIAL DE ÁVILA EN EL OAR. APROBACIÓN DEL PADRÓN DE TASAS DE AGUA POTABLE Y RECOGIDA DE BASURA 1º SEMESTRE 2017 Y PERÍODO DE COBRO. INFORMACIÓN PÚBLICA DE LAS TARIFAS DE UTILIZACIÓN DEL AGUA DE LA ZONA REGABLE DEL TIÉTAR PARA EL AÑO 2017. INFORMACIÓN PÚBLICA DE LOS CÁNONES DE UTILIZACIÓN DEL AGUA DEL ABASTECIMIENTO A LAS NAVAS DEL MARQUÉS PARA EL AÑO 2017. APROBACIÓN DEFINITIVA DE LA MODIFICACIÓN DEL REGLAMENTO DE RÉGIMEN INTERNO DEL CENTRO DE EDUCACIÓN INFANTIL LAS MORERAS. MODIFICACIÓN ARTÍCULO 6º DE LA ORDENANZA FISCAL DE LA TASA POR INSTALACIÓN DE PUESTOS Y OTROS, SITUADOS EN TERRENOS DE USO PÚBLICO LOCAL. RESOLUCIÓN EXPTE. 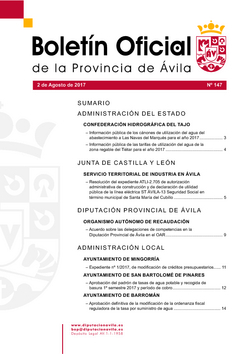 ATLI-2.705 DE AUTORIZACIÓN ADMINISTRATIVA DE CONSTRUCCIÓN Y DE DECLARACIÓN DE UTILIDAD PÚBLICA DE LA LÍNEA ELÉCTRICA ST ÁVILA-13 SEGURIDAD SOCIAL EN TÉRMINO MUNICIPAL DE SANTA MARÍA DEL CUBILLO.